Here are some amazing birds' nests we made using twigs and other natural foraged materials. Great fun and a very proud day! All workshops (listed below) are always taught by me, there are no substitutes. 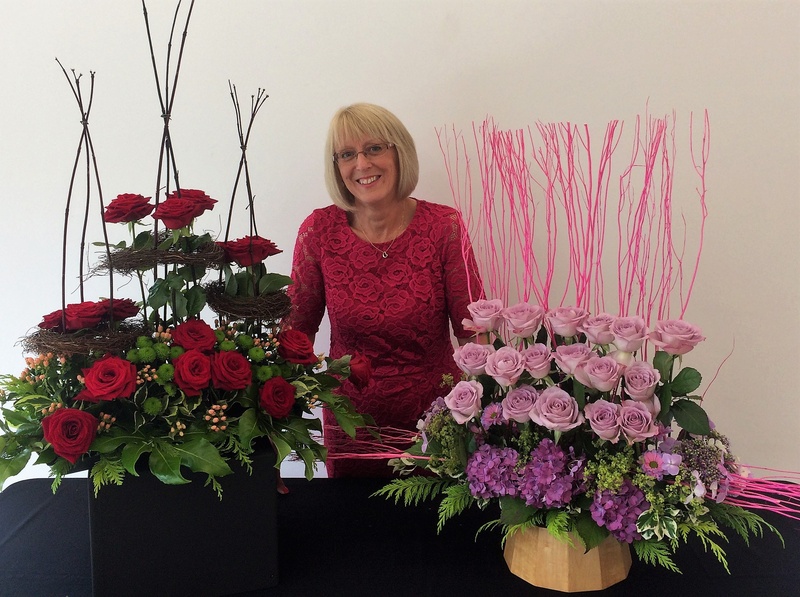 I am a very friendly, patient and caring tutor with a huge passion for fun, flowers and floral design. Oh, and just in case you are wondering, I am a fully qualified tutor, I have won numerous awards for my teaching and I have over 30 years experience. I guarantee you will go home from your workshop with not only a design that you are really proud of, but one that you are happy to show off to your family and friends. Very importantly, you will have gained the confidence and experience to be able to repeat it again on your own. Workshops vary in size according to the design being made. You will always receive individual attention. Tables are provided and you will have plenty of room to work. All adults are very welcome. Take a look at what we've been up to recently here there are lots of pictures of past workshops to have a browse through. I frequently add extra workshops, so if you would like to be the first to know, please contact me and I will add you to my newsletter list. Fees are per person and are payable on booking, either by email or phone. They include unlimited refreshments and the basics to help you make your design. An easy-to-follow list showing things you need to bring to your workshop will be issued a couple of weeks before you attend. And should you wish to use it, a pop-up shop with floristry goods is available at each session. Here's a thought for you. Did you know that flowers are like friends? There is no doubt they really do brighten up your day. So bearing that in mind, why don't you come along to a workshop this year and join in the fun? 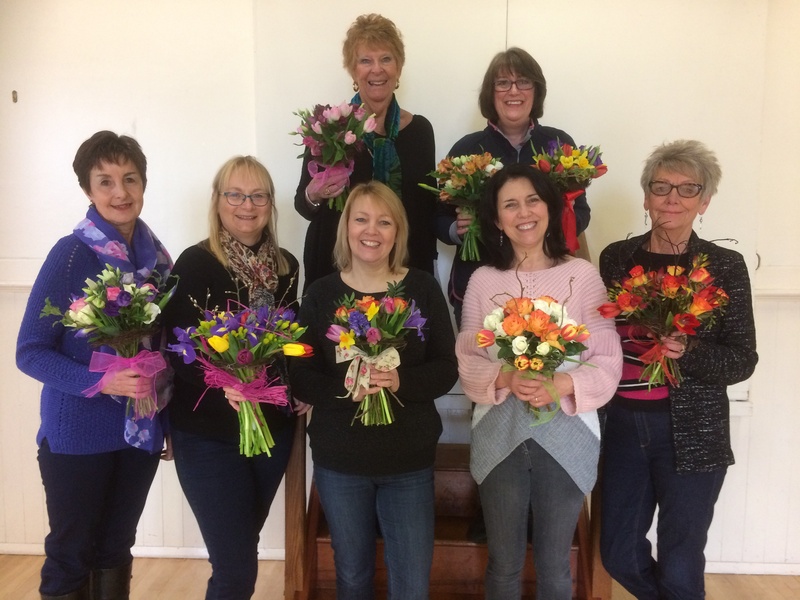 Always popular, they are not only a great way to meet like-minded people, but also give you the chance to learn a relaxing and creative skill. You will be surprised at what you can achieve, even if you have never done anything like this before. If you can't make any of my workshops, remember I can always run one for you. Many ladies groups do this at a venue of their choice - they can even be held from your home if you prefer. Private lessons are also available. And of course, not forgetting businesses - workshops are great team-building events which can be run at any location. Please don't be shy about coming alone, as plenty do! With Spring just around the corner, this design inspires and creates happiness. 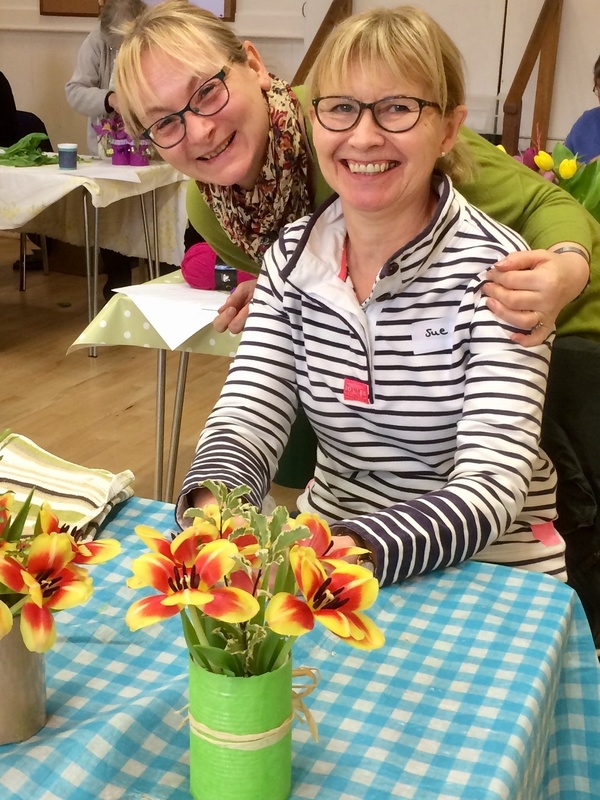 Come and learn how to make your daffodils look as though they are still growing. A trendy arrangement perfect for your home - or to give as a very special Easter gift. An awe-inspiring table centrepiece designed to keep your guests happy while they wait for their Easter Sunday lunch. Using a posy pad, glass bowl, flowers, foliage, mini chocolate eggs and more this is such fun…and definitely a feast for the eyes. 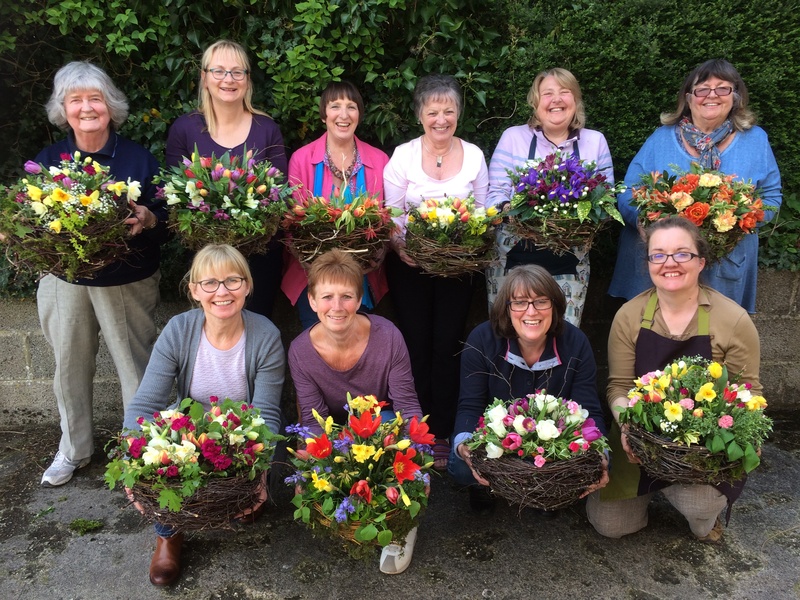 This workshop reveals how to arrange your beautiful tulips and foliage in a very stylish design. You’ll learn continental floral techniques and endless trade tips. A modern masterpiece made with your own fair hands, it’s also a perfect gift. Love foliage? Then come and enjoy a relaxing morning learning how to make a natural countryside design using freshly cut foliage from your garden. Together with foraged materials, this arrangement is just perfect for the heart of your home. This arrangement made using those gorgeous hydrangeas from your garden will look fabulous on your dining room table – and is perfect for summer al fresco entertaining. A fabulous design that can be adapted for every season, don’t miss it. All fees are payable on booking and can only be refunded or transferred to another workshop if either you or I can find another student to take your place. In the extremely unlikely event that I have to cancel, you will either receive a refund or the option to transfer to another workshop of your choice. "These workshops are always so enjoyable and have the added bonus of meeting new people with a similar interest. Instructions are very clear and easy to follow and there is always encouragement and help when needed. I have really surprised myself with the beautiful arrangements I have made and am really looking forward to the next one." "I never believed I'd be able to do something like this, I love what I've made. My daughter and grand-daughter were really pleased with theirs too, we'll be coming again." "I really enjoyed myself. I was a bit wary having not done anything like this before and concerned because I'm not arty or creative at all. However - I impressed myself and was absolutely delighted with what I made. Everyone was very friendly, everything was easy to follow, even for a complete beginner. I'm definitely coming again, it was great."